Normally you do take your pants down, even on a compost toilet. This is the little house at the bottom of the path. I hasten to say, that this is not a well designed toilet, it was an experiment, and the next one will be different. Though it works well in most respects, it is not easy to empty, and because of the one chamber design, I do have to move some uncomposted material to the sides after removing the composted 'stuff' from the edges. I won't go into too much detail about how I do it, as this is the way not to do it. I will describe the principal and how it does work shortly. This is where I will talk s**t. A frequent objection I hear to living this lifestyle is the prejudice about compost toilets. Smelly, dirty, cold, inconvenient, disgusting job emptying them, old fashioned, primitive..... 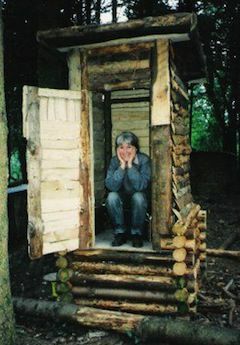 However, one comment I had recently from a visitor who actually used the compost toilet (a comment backed up entirely by my own experience) was that he felt odd going back to the flush toilet, s*****g inside the house. And to put it not too delicately, I'd rather have the pong outside, and from my experience it is actually less than inside a closed room with a flush toilet. A properly placed and used dry compost toilet has very little smell. My own toilet has no smell beyond moist sawdust, and only very occasionally a little whiff of eau de toilette, downwind for a couple of feet next to the building. And the scenery is quite something else! Scenery apart, I would have a compost toilet in the city. These toilets do not use gallons of purified water, only to flush a resource ultimately into the sea, or create a toxic sludge at the sewage works, mixed with countless unmentionable chemicals which were indiscriminately dumped into toilets, sinks, basins, and from washing machines. No, the end result of the compost toilet is a substance indistinguishable from the stuff you buy at the garden centre for putting into flowerpots. Next objection: dirty. No more so than a flush toilet. You don't eat off one. Treat it with the same hygiene level of that for a flush toilet. Use rubber gloves, avoid unnecessary contact, wash well after cleaning the toilet, and normal hygiene practices after using the toilet. I have not picked up any infection in twenty years of using one. Cold: You keep most of your clothes on. If you like to read a book I'm sure its warmer in the house, why bother doing it on the loo? More fibre in your diet may be the answer. A short trip down the garden path is no big deal, even in bad weather. Inconvenient: How often do you use the toilet per day, is it such a big deal? Disgusting job emptying the toilet: the end product is like potting compost, and a well designed toilet will mean that that is all you will handle, and with a shovel too. Old-fashioned, primitive: so what? Who cares?